Strap in kids Scott Brinker has dropped another martech landscape doozy. It’s that time of the year us marketing technology enthusiasts anticipate with the giddy enthusiasm regular folk reserve for an upcoming Game of Thrones season. To be fair both these monumental occasions have been delighting/distressing/depressing us since 2011. So without further ado, let’s dive in and take a look at what Big Bad Brinks has in store for us with his 2019 Marketing Technology Supergraphic: Martech 5000. Right…have you taken that all in? Gone cross-eyed trying to identify the literal thousands of logos? The most represented sub-category is from Commerce & Sales with 457 Sales Automation Enablement & Intelligence solutions. If I’m honest…I couldn’t tell the difference between this latest graphic and it’s 2018 predecessor ¯\_(ツ)_/¯. But don’t @ me….there are only 211 new martech companies included this year. That 3% growth is the smallest we’ve seen since we were introduced to the graphic waaayyy back in 2011. This year’s itty-bitty growth doesn’t signify martech is slowing down necessarily says Scott Brinker, but rather that it is “flattening out, a plateau”. 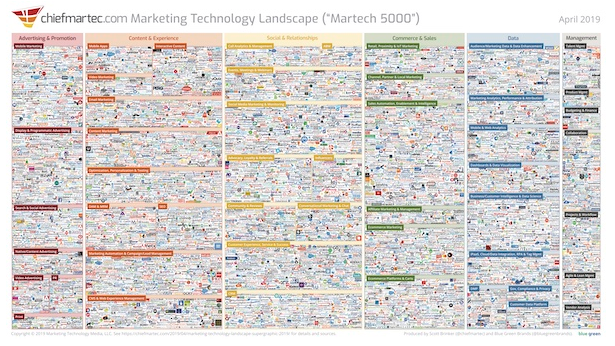 Is this the end of the MarTech Landscape Supergraphic as we know it? Brinker freely admits the limitations of the landscape and acknowledges a number of martech pockets not represented from martech apps built for specific platform ecosystems, open-source and citizen developed apps, apps built by services or consulting groups and many regional martech apps. In fact the recent UK version, Finnish, Swedish and German versions combined revealed an additional 563 companies that had not featured on previous versions of the global edition. While we might not be peak martech…it seems we could be at peak martech landscape and - as with Game of Thrones *sobs* - witnessing the end of an era? 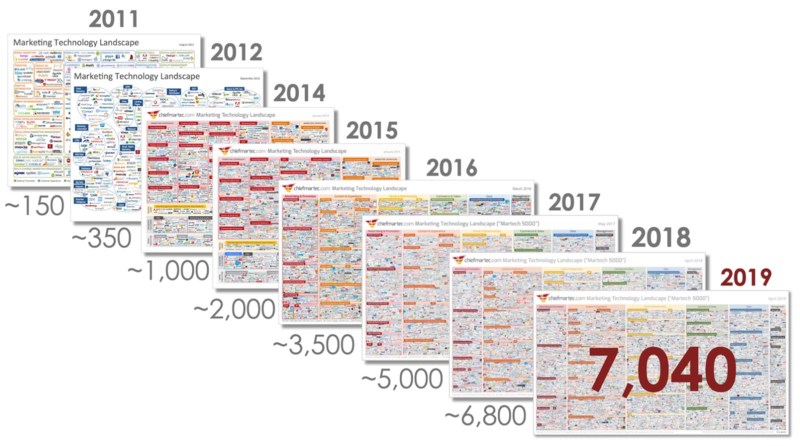 With platforms such as WordPress offering upwards of 50,000 plugins many of which, if not all could be considered mini martech apps in their own right and the “long, long, loooooong tail of martech” – it seems that we have evolved beyond the reality that the entire landscape can be condensed down to one nicely packaged visual representation. So what can we learn from the landscape? We turn to the eminent founder of the MarTech Alliance, producer of the UK martech landscape, creator of the #MarTechFest and self-confessed martech obsessive Carlos Doughty to get his thoughts on the landscape and its significance for modern marketers. The fact that the landscape was as small as 150 solutions just 8 years ago is what marketers need to know if they don’t already. “The landscape,” he says “helps drive the martech movement, but the take way of it isn’t new for 2019: it’s an ever increasingly complex space that requires real planning to tackle it effectively and the job is never done. Whether it had jumped to 9k this year or retracted by 2k makes little difference for most marketers. The fact that the landscape was as small as 150 solutions just 8 years ago is what marketers need to know if they don’t already." Join us at #MarTechFest with headline speaker Scott Brinker this year for insight on how to approach not just the platforms, tech and tools that make up your martech stack, but the development of your martech road map, how to identify the skills, people, partners and team structure required to deliver your martech strategy as well as the application of the correct processes and operations to ensure speed, adaptability and rapid experimentation.